Videos, examples, solutions, and songs to help Kindergarten and Grade 1 kids learn the Fact Families. 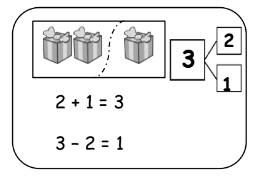 Fact Families will help students to apply properties of operations as strategies to add and subtract. I can use properties of operations to add and subtract. I can give an example and explain how a subtraction equation can be rewritten as an addition equation. I can rewrite a subtraction equation as an addition equation with a missing addend. Rather than 9 - 6 = ___ ask how many would you add to six to equal nine? How to solving addition and subtraction fact families when all three numbers are given? How to solving addition and subtraction fact families when there is a missing addend or sum? 1. Rachel and Lucy are playing with 5 trucks. If Rachel is playing with 2 of them, how many is Lucy playing with? 2. Jane caught 9 fish at the end of the day. She caught 7 fish before she ate lunch. How many fish did she catch after lunch? 3. Dad bought 6 shirts. The next day he returned some of them. Now he has 2 shirts. How many shirts did Dad return? How to complete a fact family using a part-part-whole method? 3, 4, and 7 (Addition and subtraction). This song helps children understand fact family for addition and subtraction. Learn about fact families and fact triangles for subtraction. 1. Write a fact family for the group of numbers. 2. Complete the Fact Triangle and write the fact family. Want to help your first grade child with their math lessons? Teach your child the fact families.